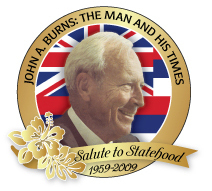 Premier Telecast Wednesday, April 15, 9:00 p.m.
Rebroadcast Sunday, April 19, 4:00 p.m.
AS HAWAII CELEBRATES ITS 50TH ANNIVERSARY OF STATEHOOD, the inspirational hour-long 2000 television documentary “John A. Burns: The Man and His Times” will be updated, re-broadcast, and released in a special Statehood Anniversary Commemorative Edition DVD by EMME, Inc., Emme Tomimbang Multi-Media Enterprises. This special encore presentation of Hawaii’s former Governor and architect of the modern-day Democratic Party in the islands will be shown on KHON Channel 2 Wednesday, April 15 at 9:00pm and re-broadcast Sunday, April 19 at 4:00pm. The program is hosted by Emme Tomimbang with a newly-created introduction by retired Chief Judge of Hawaii’s Intermediate Court of Appeals and son of the late governor, the Honorable James S. Burns. Territorial Delegate to the United States House of Representatives John A. Burns had a pivotal role in helping bring about statehood in 1959 for the islands by ushering the Statehood bill through Congress, with the assistance of friends and allies House Speaker Sam Rayburn and then Senate Majority Leader President Lyndon B. Johnson. Burns helped organize and grow the post-World War II Democratic Party in the islands and statehood was one of the goals of self-determination for Hawaii residents. Burns went on to serve as Hawaii’s Governor from 1962 to 1974. He died in 1975. “John A. Burns: The Man and His Times”, originally produced and aired on the 25th anniversary of his death, looked back at the impact he had on life in the islands and the power of citizenship he helped bring to all who called Hawaii home. Released in conjunction with historian and journalist Dan Boylan’s companion book, the original program was a landmark comprehensive examination of a life of public service. Testimonials and remembrances from Governor George Ariyoshi, Governor Benjamin Cayetano, former Bishop Estate Trustee Matsy Takabuki, former Chief Justice William S. Richardson, Lieutenant Governor Thomas Gill, Senator Daniel Inouye and others round out the show. A new introduction to the DVD and other extra features will be included in the Commemorative DVD limited edition release, produced by Tomimbang and authored by Makaha Studios — the for-profit spin-off of Searider Productions, Waianae High School’s award-winning media education program whose students produced the official Statehood Anniversary Commission's "50 Voices of Statehood" vignette series now being broadcast throughout Hawaii. The documentary “John A. Burns: The Man and His Times” was co-written and directed by Lisa Altieri and Roy Kimura, shot by videographer Rodney Ohtani and adapted from the book co-authored by Dan Boylan and Michael T. Holmes. Cost for the Commemorative DVD is $25.00. The book is out of print in Hawaii. For more information and/or interviews on the rebroadcast, or purchasing the commemorative DVD, call (808) 947-6677. “John A. Burns: The Man and His Times” television documentary is presented by: Hawaiian Airlines and Central Pacific Bank. Co-sponsored by: Hawaiian Electric Company, Hawaii Government Employees Association, and United Public Workers and with support from City Mill. Close Captioning provided by: The Caption Company and The Queen’s Medical Center. DVD funding and support from: Hawaii State Teachers Association, Pundy Yokouchi Family Foundation, Kodani & Associates, Inc., Wayne M. Corn, Earl Pamai Tenn, Turk Tokita, and Big Save Kauai.